“Woody Sez: The Life & Music of Woody Guthrie” – which plays at the Irish Repertory Theatre’s newly minted, permanent home on 22nd Street—is a sumptuous slice of Americana, a down-home celebration of a founding father of our nation’s folk music, and a starkly relevant piece of political theatre. Singer-Songwriter Woody Guthrie (1912-1967) is perhaps best known for his social justice anthem “This Land Is Your Land” (I’m sure you are humming it right now), but he also penned hundreds of other songs that shaped and informed generations of American folk music to follow. Guthrie was a champion of the everyman, a voice for the forgotten, and a forceful, radical patriot who offered homespun wit and shattering political commentary in the same breath—no easy feat. His view was an accessible, unvarnished take on the American experience, borne from living through the ravaged poverty of Dust Bowl Oklahoma and Texas, hitchhiking from coast to coast during the Great Depression, and serving in the Merchant Marine during World War II. Along the way, Guthrie slept beside migrant farmworkers, sang at union halls, spoke out against racism, critiqued capitalism and organized religion, and produced a stunning body of work—all before being tragically silenced by Huntington’s Disease at the age of 55. Precisely 50 years since his death, “Woody Sez” is a fleet musical celebration that tells Guthrie’s life story by way of some 25 of his songs. The music is infectious, the story fascinating, and the history and politics eerily on point. First performed as part of the Edinburgh Festival Fringe in 2007, and polished on a 10-year tour through a whopping 63 countries, “Woody Sez” arrived in New York this summer amidst a fraught political climate. 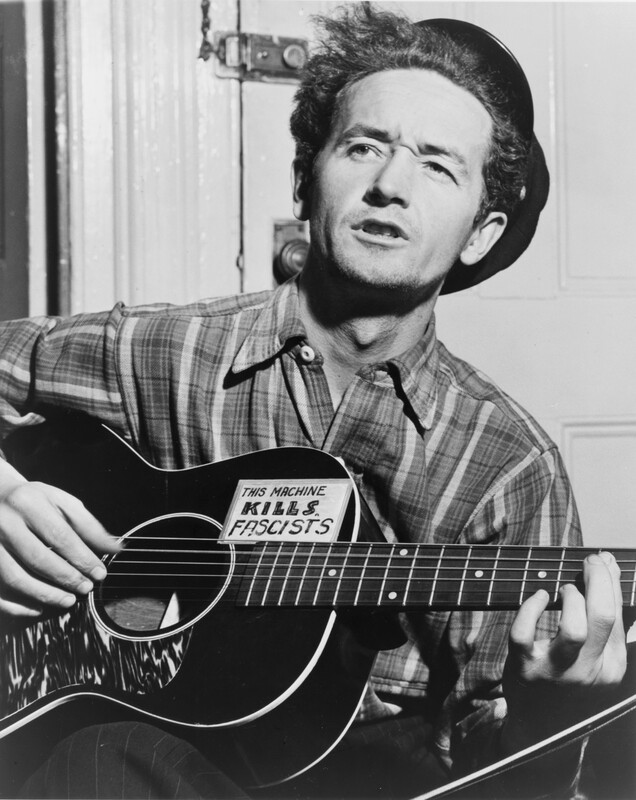 The “this machine kills fascists” sticker famously emblazoned on Guthrie’s guitar is a refreshing reminder of a simpler time when hating Nazis was not something we debated in America. When Guthrie savages bankers, decries walls, sings a paean to deportees, and implores us that “fascism is all around you, closer than I can make you see it”, you are reminded of that old truism that the more things change, the more they stay the same, or is it those who cannot remember the past are condemned to repeat it? Guthrie never set out to be expressly political, and neither does this show, but that honesty and authenticity is what made his work, and by extension this show, so effective at making political points. He wasn’t trying to sell anything, or push a cohesive partisan ideology (“left wing, right wing, chicken wing” was a particular favorite line of mine), rather he observed, he reported, and in so doing he agitated and illuminated. Like his fellow Oklahoman Will Rogers, Guthrie functioned as somewhat of a living, breathing American fortune cookie. And, yes, for those keeping score, he was an Irish-American, lest the Irish Repertory Theatre stray from its mission. Guthrie is played by the musical’s creator and music director David Lutken, whose “aw, shucks” demeanor, casual confidence, and fantastic musicianship are effortless and infused with joy. Likewise, the cast of three actor-musicians who support him, and play an array of characters, radiate a spirit of joyfulness that is simply contagious. Of note, the sets and lighting by Jeffrey Meek and Michael Gottlieb, respectively, effectively evoke Guthrie’s America of the 1930s and 40s, and create a haunting, nostalgic mood. I thoroughly enjoyed my trip through the journey of an American icon’s extraordinary life, and found great meaning in his lessons and admonitions. In one somber and sobering moment, Guthrie reflects on “the fight” for justice and progress that he sees around him; it’s always been going on, he notes, and so we must continue on. Good advice for these times. Bottom Line: “Woody Sez” is a sumptuous slice of Americana, a down-home celebration of a founding father of our nation’s folk music, and a starkly relevant piece of political theatre; lovers of folk music should run to catch it before it closes on September 10th.